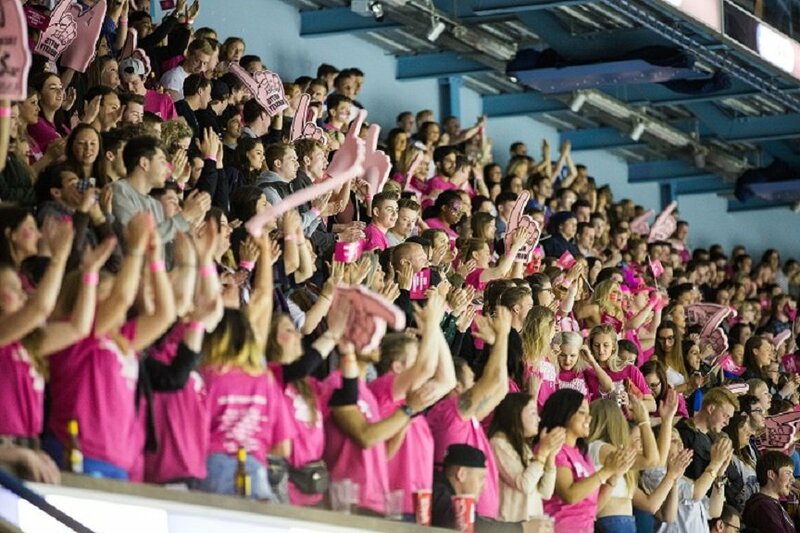 Varsity 2018 is around the corner, and NTU competitors will be counting on the crowd to cheer them to victory at sports courts and facilities across Nottingham. In what will be a thrilling display of university sport, NTU is looking to reclaim the Varsity Crown this year as we take on our neighbours, University Of Nottingham. As well as getting yourself to games and events across the board, there are a number of fun ways to show you are NTU and #ProudtobePink. Here’s some of our favourite ways to ‘go pink’ and show your support for Team NTU this varsity series. Grab yourself a pink Varsity 2018 T Shirt and wear it with pride throughout the series. You can get yours at the SU shops. They’re just £6! We love nothing more than seeing students routing for their teams. When you tweet / post updates, images and videos, be sure to tag @NTUSport. You can catch the NTU Mascot at both city and Clifton campuses drumming up support for the home team in his pink T Shirt. You can’t miss him, he’s a tiger! Get your picture taken with him and post with official hashtags to show you’re proud to be pink. Go to an SU Shop to buy your very own pink foam finger to wave about in the crowd. Foam fingers are £4, and when you buy it with a T shirt both are £8. The ultimate demonstration of pink pride – painting your face in NTU’s iconic hot pink. Be sure to use safe face paints and do a skin test beforehand. Keep well away from your eyes – pink finger-painted cheeks are an excellent demonstration of #pinkarmy pride. Did you know that you can use varsity filters on your snapchat stories? Check it out – look out for the filters at sports events. Feeling crafty? Get really creative by making your own NTU Pink Pom-Poms to wave in the crowd. There are plenty easy of how-to’s on Pinterest, go take a look. Use all of those pink emojis when you’re tweeting or posting your messages of support to our teams. We face some tough competition, but this year we have every chance of winning back the title of Varsity Champions. Check out just some of the sporting talents who will be hoping to help bring NTU to victory this series. 10. be loud and proud! Make sure our NTU Sports teams and competitors can hear you cheering them on. Your support could be the tipping point to taking a victory for the pinks.